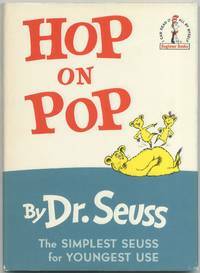 Hop on Pop is a 1963 children's picture book by Dr. Seuss (Theodor Geisel). It was published as part of the Random House Beginner Books series, and is subtitled "The Simplest Seuss for Youngest Use". It contains several short poems about a variety of characters, and is designed to introduce basic phonics concepts to children. New York: Beginner Books, 1963. Hardcover. Fine/Fine. First edition. Thin quarto. Fine in slightest bit rubbed fine dustwrapper. New York: Beginner Books, Random House, Inc.,, 1963. Octavo. Original glossy pictorial boards. With the dust jacket. Illustrations throughout by the author. Wear to spine ends of dust jacket, rubbing to bottom board edge, light wear to dust jacket sides. A very good copy. First edition, first printing. New York: Beginner Books, Random House, Inc.,, 1963. Octavo. Original glossy pictorial boards. With the dust jacket. Illustrations throughout by the author. Spine very slightly rolled, boards lightly toned, extremities rubbed. A very good copy in the toned jacket. First edition, first printing. New York: Beginner Books, Random House, Inc.,, 1963. Octavo. Original glossy pictorial boards. With the dust jacket. Illustrations throughout by the author. Contemporary gift inscription from father to son to head of front free endpaper. Small ink mark to head of front pastedown. Minor wear to spine ends and tips, a touch of rubbing to bottom edge, slight binder's glue residue to turn-ins; a very good, fresh, copy, in the faintly soiled jacket with slight rubbing to edges and rear cover. First edition, first printing, of the 29th book in the Beginner Books series. This work contains several short poems and was designed to introduce basic phonics concepts to children. SEUSS, DR.. SEUSS,DR. HOP ON POP. NY: Random House 1963. 8vo (6 3/4 x 9 1/4"), glazed pictorial boards, 64p., near Fine in dust wrapper with light soil and creasing on edges. 1st edition (and no ads for later titles, price not a factor with correct ads). The simplest Seuss for Youngest use. A popular Seuss title not easy to find in collectible condition. Younger / Hirsch 30. Random House, 1963 Published in New York by Random House in 1963. First Edition, correct price and no ads for later titles (according to the Younger Bibliography). Book very good. DJ very good. DJ price reads 195/195.. First Edition. Hardcover. Very Good/Very Good. New York: Random House, 1963. First Edition. Hard Cover with Dust Jacket. Near Fine/Near Fine. Small quarto, 64 pages, paper covered pictorial boards, dust jacket. Price of 195/195 on front flap of dust jacket and first edition issue points on rear flap listing 5 Beginner Books titles as well as 17 Dr. Seuss Bigger Books titles; 5 blurbs on rear panel of dust jacket. "B-29" at foot of spine of book and of dust jacket. Book and dust jacket show minor wear at extremities; near fine/near fine. [Younger/Hirsch, pp. 82-84]. Seller: Charles Parkhurst Rare Books, Inc.
Radom House, 1967 Published in New York by Random House in 1963. First Edition, correct price and no ads for later titles (according to the Younger Bibliography). Book very good. DJ very good. DJ price reads 195/195.. First Edition. Hardcover. Very Good/Very Good. New York: Random House, 1963. Book. Very Good. Hardcover. 1st Edition. 8vo - over 7¾ - 9¾" tall. The Simplest Seuss for Youngest Use. Small piece missing on corner of front free endpaper without loss of text. Inside clean without inscriptions or markings. In very good, first edition dustjacket. Dustjacket is price-clipped with light wear at corners and head and tail of spine..
New York: Beginner Books / Random House, 1963. Possesses all first edition points given by Younger. (195/195 price, rear flap lists 5 Beginner titles, 17 Bigger, 5 blurbs rear panel.) Quite a nice copy. Very slight shelf wear bottom boards. Jacket has a tiny chip at bottom of front flap, short closed tear head of spine, and tiny stress tear along front joint. . First Edition/First Printing. Pictorial Hardcover. Near Fine/Very Good+. 2003-02-06. New. Ships with Tracking Number! INTERNATIONAL WORLDWIDE Shipping available. Buy with confidence, excellent customer service! 2007-05-02. New. Ships with Tracking Number! INTERNATIONAL WORLDWIDE Shipping available. Buy with confidence, excellent customer service! 2004-01-01. New. Ships with Tracking Number! INTERNATIONAL WORLDWIDE Shipping available. Buy with confidence, excellent customer service! 2006-06-09. Good. Ships with Tracking Number! INTERNATIONAL WORLDWIDE Shipping available. May not contain Access Codes or Supplements. May be ex-library. Shipping & Handling by region. Buy with confidence, excellent customer service! London: Collins, 1964 unclipped dust jacket with minimal handling wear, small ink gift inscription at head of fep, boards slightly rubbed to edges, very clean and tidy copy scarce in such a nice dust jacket, first UK issue, 64pp. First Edition. Pictorial Boards. Very Good/Very Good. Illus. by Theodore Geisel Seuss. 8vo - over 7? - 9? tall. 2006-05-02. New. Ships with Tracking Number! INTERNATIONAL WORLDWIDE Shipping available. Buy with confidence, excellent customer service! 2007-08-07. New. Ships with Tracking Number! INTERNATIONAL WORLDWIDE Shipping available. Buy with confidence, excellent customer service! 1991-01-01. New. Ships with Tracking Number! INTERNATIONAL WORLDWIDE Shipping available. Buy with confidence, excellent customer service! 2003-01-08. New. Ships with Tracking Number! INTERNATIONAL WORLDWIDE Shipping available. Buy with confidence, excellent customer service! 2015-07-04. New. Ships with Tracking Number! INTERNATIONAL WORLDWIDE Shipping available. Buy with confidence, excellent customer service! New York: Random House. Good+ in Good dust jacket. 1963. First Edition. Hardcover. 039480029X . A 1 1/4" tear at tail of dust wrapper spine. Several 1/2" tears and 3/8" chips in edges of dust wrapper. Some foxing to dust wrapper. Some foxing to endpapers. No signatures. ; 64 pages + illustrated endpapers. Hardcover. An early printing, with price of "195/195" on front flap of dust wrapper. The rear flap of the dust wrapper lists 5 + 17 titles. The rear panel of the dust wrapper does not have the 5 educator reviews which the first printing has. ; 8vo . 2004-07-04. New. Ships with Tracking Number! INTERNATIONAL WORLDWIDE Shipping available. Buy with confidence, excellent customer service! 2008-08-04. New. Ships with Tracking Number! INTERNATIONAL WORLDWIDE Shipping available. Buy with confidence, excellent customer service! 2003-02-06. Good. Ships with Tracking Number! INTERNATIONAL WORLDWIDE Shipping available. May not contain Access Codes or Supplements. May be ex-library. Shipping & Handling by region. Buy with confidence, excellent customer service! New York: Random House, 1963. HOP ON POP- Dr. Seuss- Illustrated By Author- Random House-NY-1963- 1st Edition-2nd Printing- 'Beginner Books'- 'The Simplest Seuss for Youngest Use'- Hardcover:-8vo- VG+/ Fair++-VG- dj has some internally repaired nicks-3/4 inch piece missing from lower spine- unclipped-original $1.95 on inner flap- book has no tears or writing-some reading smudges and bumped spine ends but clean and bright- All Younger Hirsch points as follows: $1.95 price on dj- back lower flap of dj -copyright 1963- 5 Beginner titles with top being Hop On Pop and last The Cat In The Hat Comes Back- 17 Bigger books ending with Dr. Seuss' Sleep Book- no 5 educator blurbs on back dj leads us to believe this is a second printing or a 1st edition printing with a 2nd state jacket.- Scarce nonetheless! -Fiction-children's-Beginner Books-illustrated (495). 1st Edition-2nd Printing. Illustrated Glossy Boards. VG+/Fair++-VG. Illus. by Illustrated By Author. 8vo - over 7¾" - 9¾" tall. New York: Random House. 1963. First Edition; First Printing. Hardcover. Very Good in boards. Edge wear. Soiling to front and rear panels. ; 8vo 8" - 9" tall; All domestic orders shipped protected in a Box. .
New York: Random House, 1963. Book. Very Good +. Hardcover. First Edition - First Printing. The book has shelf wear to the lower edge. The dust jacket has light edge wear with some rubbing. Younger & Hirsch 30, First Edition. 195/195 price on the front flap of the dust jacket. The rear flap lists five titles for Beginner Books to Cat in the Hat Comes Back and 17 titles for Bigger Books to Dr. Seuss's Sleep Book. The back panal lists five reviews from educators..
2004-01-01. Good. Ships with Tracking Number! INTERNATIONAL WORLDWIDE Shipping available. May not contain Access Codes or Supplements. May be ex-library. Shipping & Handling by region. Buy with confidence, excellent customer service! 1: A Weatherbys Publication, 2001. Paperback. Good. Large format paperback book in good condition. 2001 Weatherbys Publication. Beautifull colour pictures of each stallion, together with details of pedigree, racing career, stud record and location. Packed with information if you have an interest in horse racing. - used books, secondhand books, out of print books, hard to find books, for sale, second-hand books, college books, student books, nonfiction, first edition, exlibrary, , non-fiction books delivered world wide. 2000-05-02. Good. Ships with Tracking Number! INTERNATIONAL WORLDWIDE Shipping available. May not contain Access Codes or Supplements. May be ex-library. Shipping & Handling by region. Buy with confidence, excellent customer service! 2003-01-08. Good. Ships with Tracking Number! INTERNATIONAL WORLDWIDE Shipping available. May not contain Access Codes or Supplements. May be ex-library. Shipping & Handling by region. Buy with confidence, excellent customer service! 1987-07-05. Good. Ships with Tracking Number! INTERNATIONAL WORLDWIDE Shipping available. May not contain Access Codes or Supplements. May be ex-library. Shipping & Handling by region. Buy with confidence, excellent customer service! 2007-08-07. Good. Ships with Tracking Number! INTERNATIONAL WORLDWIDE Shipping available. May not contain Access Codes or Supplements. May be ex-library. Shipping & Handling by region. Buy with confidence, excellent customer service! 2007-05-02. Good. Ships with Tracking Number! INTERNATIONAL WORLDWIDE Shipping available. May not contain Access Codes or Supplements. May be ex-library. Shipping & Handling by region. Buy with confidence, excellent customer service! Hardcover. 64 pp. Beginner Books/Random House, New York (1963). First Edition. Early Printing. No DJ. D thru K Letter Line and 2 thru 4 Number Line on Title Page. Bright, clean, unmarked pages. PO name on FFEP. Light soiling of boards. Bottom corners scuffed. Several small superficial linear dents to front board. Two small round dents to rear board. Very Good condition overall. More photos on request. Shipped in a box within a box, in bubble wrap, with a tracking number. Random House, 1963. First edition [Early printing]. Hardbound. very good with slightly worn d.j. that has a small tear at the heel of the spine and has a three inch tear at the crown.. $2.50 price on d.j. and lists Fox in Socks on rear flap. probably a 1966 printing. Condition: very good with slightly worn d.j. that has a small tear at the heel of the spine and has a three inch tear at the crown. China Translation and Publishing Corporation. hardcover. New. Ship out in 2 business day, And Fast shipping, Free Tracking number will be provided after the shipment.Hardcover. Publisher: China Translation Satisfaction guaranteed,or money back. New York: Random House, 1963. First Edition. Hardcover. Very Good Condition/Fair. Jacket worn at the edges with a large chip missing from the head of the spine and a long jagged tear across the front panel with marks from an old (removed) tape repair. Light wear to book edges, first signature with title page a little loose - a reasonable copy of the first edition with all the points as per Younger 30. Size: Octavo (8vo). Quantity Available: 1. Shipped Weight: Under 1 kilo. Category: Children; Inventory No: 043002. Picture Lions. PAPERBACK. 0001713094 New Condition. . New. Yuan Liu Chu Ban Gong Si. Hardcover. 9573214598 New Condition. . New. Collins. Hardcover. 0007175949 New Condition. . New. 2006-05-02. Good. Ships with Tracking Number! INTERNATIONAL WORLDWIDE Shipping available. May not contain Access Codes or Supplements. May be ex-library. Shipping & Handling by region. Buy with confidence, excellent customer service! 2015-07-04. Good. Ships with Tracking Number! INTERNATIONAL WORLDWIDE Shipping available. May not contain Access Codes or Supplements. May be ex-library. Shipping & Handling by region. Buy with confidence, excellent customer service! 2004-07-04. Good. Ships with Tracking Number! INTERNATIONAL WORLDWIDE Shipping available. May not contain Access Codes or Supplements. May be ex-library. Shipping & Handling by region. Buy with confidence, excellent customer service! 2008-08-04. Good. Ships with Tracking Number! INTERNATIONAL WORLDWIDE Shipping available. May not contain Access Codes or Supplements. May be ex-library. Shipping & Handling by region. Buy with confidence, excellent customer service!